Complete all-in-one convenience with a refrigerator-freezer, cooktop, sink, and storage compartment in just 30"
Summit brings true convenience to smaller spaces with all-in-one combination kitchenettes. 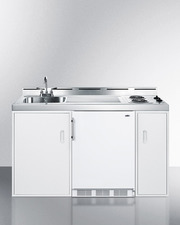 Available in four sizes, these units come fully featured with everything you need for the home foodservice experience, including a 2-burner cooktop, sink, storage cabinet, and refrigerator with a freezer compartment. 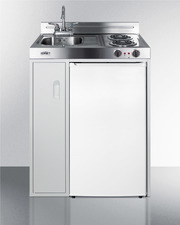 The C30EL is a 30" wide kitchenette with an easy-fitting 24" depth. The 115V cooktop features two coil elements, with front-located knobs for easy cooking and a preinstalled cord. 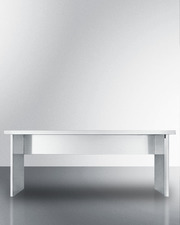 The stainless steel surface countertop offers durability with a professional look. 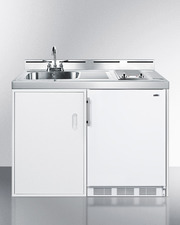 This unit includes a compact sink with ready-to-use faucet included. A cabinet with a removable shelf is located below the sink for dry storage. Unlike our competitors, who rarely offer freezers on compact kitchenettes, the C30EL includes the CM406W refrigerator with a freezer compartment. The refrigerator-freezer also includes adjustable glass shelves, door storage, and a large crisper. The C30EL is packaged and shipped in one box. Perfect for studio apartments, hotel rooms, dormitories, assisted living facilities, temporary kitchen facilities, and any other location in need of a low maintenance, fully featured compact kitchenette at one great price.